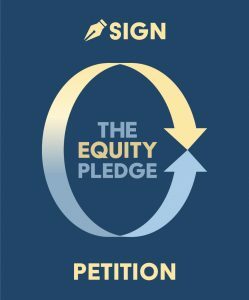 Santa Cruz, CA, March 14, 2016 – After numerous independent surveys have suggested alarming rates of anti-Semitic activity on college and university campuses across the country, AMCHA Initiative, today released the first empirical study of its kind demonstrating that anti-Zionist activities, including BDS, anti-Israel student groups and faculty who endorse an academic boycott of Israel, are at the heart of the rise in campus anti-Semitism. To understand more fully the nature and scope of anti-Semitism on U.S. campuses, as well as the factors influencing it, AMCHA Initiative investigated anti-Semitic activity over the last year on more than 100 public and private colleges and universities with the largest Jewish undergraduate populations. Unlike previous studies, which assessed levels of campus anti-Semitism by measuring student attitudes and subjective reports, the study released today assessed anti-Semitic activity by focusing on verifiable incidents compiled from media accounts and eyewitness reports. Anti-Semitic Expression – Incidents with language or imagery that used one or more of eight tropes included in the U.S. State Department definition of anti-Semitism. Targeting of Jewish Students – Incidents involving behavior that targeted Jewish students for particular harm including physical assault, harassment, destruction of property, discrimination and suppression of speech. BDS Activity – Promotion or endorsement of an anti-Israel boycott, divestment or sanction effort. Campus BDS campaigns routinely employ rhetoric and imagery intended to demonize and delegitimize Israel, expression which is consistent with the U.S. State Department definition of anti-Semitism. 1) Campus anti-Semitism is highly prevalent in public and private schools with significant Jewish undergraduate populations, irrespective of school size. More than 300 anti-Semitic incidents occurred at top Jewish schools in 2015. 70% of schools played host to one or more kinds of anti-Semitic activity. 2) Strong correlation between anti-Zionist student groups such as Students for Justice in Palestine (SJP) and anti-Semitism. 99% of schools with one or more active anti-Zionist groups had one or more incidents of anti-Semitic activity, whereas only 16% of schools with no active anti-Zionist student group had incidents of overall anti-Semitic activity. 57% of the schools with one or more active anti-Zionist student groups had one or more incidents that targeted Jewish students for harm, 91% of the schools with one or more active anti-Zionist groups showed evidence of anti-Semitic expression, and 80% of schools with one or more active anti-Zionist groups showed evidence of BDS activity. 3) Strong correlation between the presence of faculty who have expressed public support for an academic boycott of Israel and anti-Semitism. 81% of the schools with one or more faculty boycotters had one or more incidents of overall anti-Semitic activity, whereas only 17% of schools with no faculty boycotters had incidents of anti-Semitic activity. 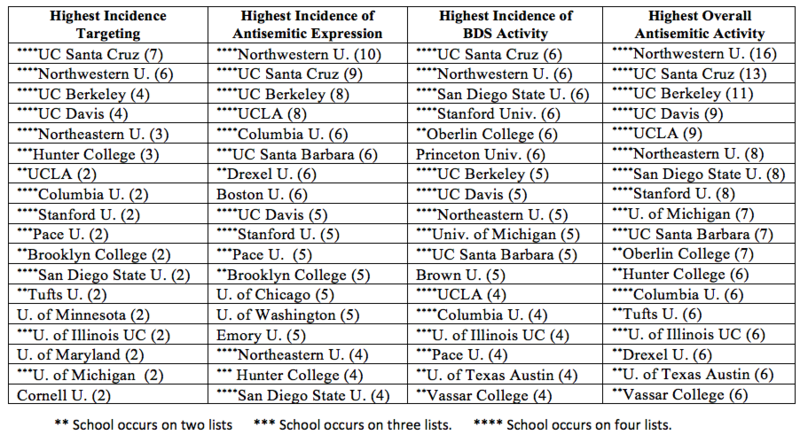 100% of the 33 schools with 10 or more faculty boycotters had one or more incidents of anti-Semitic activity. 46% of schools with faculty boycotters showed evidence of targeting Jewish students for harm, 74% of schools with faculty boycotters showed evidence of anti-Semitic expression, and 62% of schools with faculty boycotters showed evidence of BDS activity. 4) BDS activity strongly correlates with anti-Semitic activity. 56% of schools with evidence of BDS activity had one or more incidents that targeted Jewish students for harm, whereas of the schools with no evidence of BDS activity, only 23% had incidents targeting Jewish students. In fact, schools with more incidents of BDS activity tended to have more incidents that targeted Jewish students for harm. 95% of schools with BDS activity had one or more incidents of anti-Semitic expression, whereas of the schools with no evidence of BDS activity, only 33% had anti-Semitic expression. Schools with more incidents of BDS activity tended to have more incidents of anti-Semitic expression. 5) Presence of SJP, faculty boycotters and BDS strong predictors of anti-Semitism. The presence of anti-Zionist student groups and the number of faculty who have publicly endorsed an academic boycott of Israel are, in combination, very strong predictors of overall anti-Semitic activity. BDS activity is the strongest predictor of incidents that target Jewish students for harm, the factor with the most deleterious effect on campus climate. 6) Anti-Zionism permeates and is inseparable from contemporary campus anti-Semitism. More than 150 talks, rallies, statements, films, displays, agitprop, op-eds and social media posts contained expression that demonized or delegitimized Israel by drawing on classic anti-Semitic tropes of Jewish evil, power and mendacity. At one-quarter of the schools, speakers and writers were explicit about their anti-Zionist stance, indicating that they were not simply critical of Israel’s policies but opposed to the very existence of the Jewish state. In fact, at many schools there was a clear conflation of classic anti-Semitic and anti-Zionist expression, indicating that the speaker or writer did not distinguish between the two. A majority of incidents that threatened the safety or well-being of Jewish students or violated their civil rights were linked to Israel or Zionism. 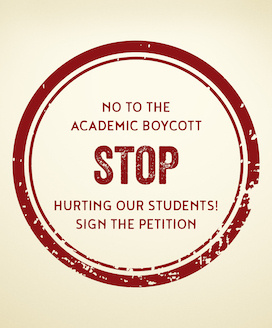 AMCHA has been leading a coalition of more than 40 groups that is calling on university leadership to acknowledge a distinction between scholarly debate and criticism of Israel’s policies and anti-Zionism – i.e. calls for the destruction of Israel — which is anti-Semitic and breeds additional anti-Semitism. Pope Francis, President Obama, British Prime Minister Cameron, French Prime Minister Valls, former Secretary of State Clinton and the majority of presidential candidates have all stated that denying Israel’s right to exist is anti-Semitism. A Trinity College and Louis D. Brandeis Center for Human Rights Under Law study revealed that 54% of surveyed students experienced or witnessed anti-Semitism during the first six months of the 2013-2014 academic year. A survey by Brandeis University in the Spring of 2015 found that three-quarters of North American Jewish college student respondents had been exposed to anti-Semitic rhetoric. Both surveys found that anti-Israel expression, particularly expression related to BDS campaigns, was a major factor in anti-Jewish hostility. A 2015 survey conducted by AMCHA Initiative of Jewish students at the University of California found that 70% had experienced or witnessed anti-Semitism. A full copy of today’s report can be viewed here. AMCHA Initiative is a non-profit organization dedicated to combating, monitoring and documenting anti-Semitism at institutions of higher education in America.